Freedom, Democracy and Human Rights in the “New Libya.” How can we begin to describe Libya after it has been refreshed by the sweet breezes of the Arab Spring, after being liberated by a movement (or whatever) that no decent and right-minded person should ever dare to criticize? Perhaps we can refer to Libya’s religious freedom, with Egyptian Copts being detained and tortured. This followed gunmen attacking an Egyptian Coptic church in Benghazi. Or we could add some balance here, and talk about the continual attacks against Libya’s Sufi Muslims. There is even more good news, as Libyan women in schools face threats and beatings. It’s not just Libyan women who have won new respect, it is also these female British aid workers who were abducted and raped. Then there is press freedom, such a central goal for anyone claiming to seek civil liberties and freedom from dictatorship: “a large group of unidentified men stormed the headquarters of Al-Assema TV, a private news channel in Tripoli, and abducted four men, including the owner of the station Jumaa Al-Usta, the former Executive Director Nabil Al-Shibani and journalists Mohammad Al-Houni and Mahmoud Al-Sharkassi.” In the new Libya, persons displaced by war are fully respected as in the case of “serious and ongoing human rights violations against inhabitants of the town of Tawergha, who are widely viewed as having supported Muammar Gaddafi. The forced displacement of roughly 40,000 people, arbitrary detentions, torture, and killings are widespread, systematic, and sufficiently organized to be crimes against humanity and should be condemned by the United Nations Security Council.” The new Libya has apparently placed racist atrocity in the pantheon of “human rights.” All those who wash their mouths with terms like “genocide prevention” have apparently left the room. With a new Libya come new spelling conventions: the correct way to spell “oppression” is now liberation. What part of this Arab Spring do you support? “No shame and no gratitude in lawless Libya.” The commentary in the Sunday Mail (2012/3/5) is especially caustic, in ways that were previously reserved for speaking about Gaddafi, but now with some remorse: “The cemetery had remained inviolate through all the long years of enmity between Britain and the Gaddafi regime. But things are different in the new Libya.” Then the paper’s editors proceeded to draw several “uncomfortable conclusions”—again, too late—such as: “Libya after the fall of Gaddafi is a lawless and ungovernable place where horrible actions can be done with impunity by those who have enough guns. The second is that there is no gratitude among many of those we have helped. The third is that those who warned that we did not know–or care enough–who we were aiding have now been vindicated in the most spectacular and gruesome way….our leaders, and our media, should cease to be so simple-mindedly enthusiastic about endorsing every revolutionary movement that appears in the Arab world. Tyrants are bad, but their opponents are not necessarily any better.” Again, who was wrong about the Arab Spring? All we read is that “Gaddafi went on a rampage of slaughter”–as if he was fighting harmless children with their paper airplanes. Once again, absolute silence on the issue of how those fought by Gaddafi were in many cases violent Islamic reactionaries that had many times before engaged in violence against his government, and that in even more cases the anti-Gaddafi opposition targeted and murdered scores of innocent black Libyans and African migrant workers during its so-called democratic uprising. This supposedly “critical” and “nuanced” left really needs to begin addressing its own racist blind spots, if these writers from Europe and North America expect to ever again be taken seriously in Latin America. Worse yet is when Postel advances as evidence this example of absurd hyperbole, that completely destroys any credibility he might have had–it was meant to be evidence for the thesis that Chávez’s position has been politically costly and embarrassing for his leftwing allies in governments across Latin America…and note that here too not a grain of evidence is presented to support the claim. The reason is simple: the claim is false. “Many.” “Them.” “Divided public opinion.” Until the end of this paragraph, Hashem is simply casting random insinuations without indicating which people, where, and how many (and how he learns of this), really nothing about those who viewed Chávez in these now disapproving terms. 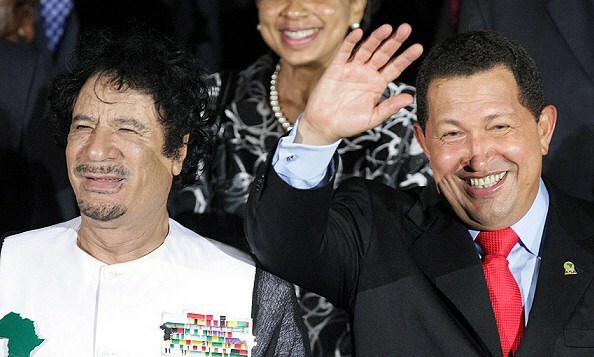 Even at the end, all we have is a vague reference to “Arab revolutionists.” Given what these Arab revolutionists have wrought in Libya–which is a very far cry from any socialist, democratic, and independent republic, one has to ask: why should Chávez have even cared about their opinion? Did he ever curry favour with Washington-supported reactionaries and racists who overthrew one of the Arab World’s few secular and socialist governments? One could imagine taking seriously that Chávez offended likeminded supporters–but these were never among them to begin with.